If I had woken up one day 5 years ago and felt like I feel right now, I would have known there was something very wrong with me. Illustration of frog in hot water by Jan Hurst. Most people have heard the analogy of the frog in the hot water. 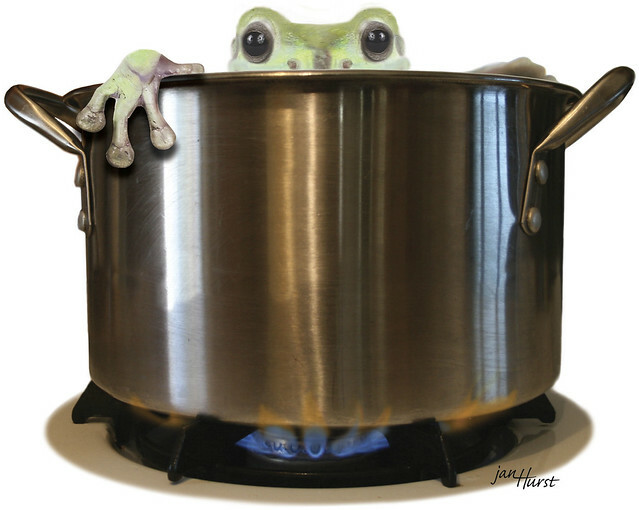 If you put a frog in boiling water it jumps out. But if you put a frog in room temperature water and slowly bring it up to boiling it stays in. That’s what “symptom creep” does to those with chronic and degenerative diseases. If I had woken up one day 5 years ago and felt like I feel right now, I would have known there was something very wrong with me. But that’s not what happened. Instead, little by little symptoms (and the severity of those symptoms) began to creep up on me. I remember when I was first (incorrectly) diagnosed in 2011, several people would comment from time to time about how I’d never mentioned having any symptoms – that I’d never mentioned having pain or fatigue – how come I’m now all of the sudden diagnosed and on all these meds? Because I had been the frog in the water that was slowly warming up. This is true with all of my symptoms. I remember my dry eyes being enough of a discomfort that I talked to my optometrist about it in 2008 and she switched my brand of contacts. In order for me to have commented on it, it must have been going on for quite a while – the discomfort didn’t happen over night – it built up until the point where I mentioned it to the doctor. If my eyes had felt back in 2008 like they feel now, I wouldn’t have even been able to put a contact in for 5 minutes, much less wear them all day every day with only some noticeable discomfort. Same with the numbness, weakness in my hands and loss of fine motor skills. It used to happen every once in a while – I’d shake it off as weird but not really concerning. Now it happens many times a day – sometimes for long periods of time. Again – had I experienced this “all of the sudden” I would have pushed much harder for answers when it started. So what’s the problem with “symptom creep”? Why is it something people should be aware of? Well, there’s two reasons. Second, one of the barriers to dealing well with these invisible diseases is being able to share and communicate with those around you what’s going on with you. They can’t see the symptom creep – it’s invisible. And if each day you’re not dramatically different than the day before it’s hard for them to understand why at some point you need to say “I’ve hit my limit.” If you’ve been able to do something for a while, but then all of the sudden the cumulative effect of the creep is so great that you’ve hit a barrier that prevents you from continuing it, it’s hard for people to realize that it’s the cumulative effect of the creep and not just the difference between yesterday and today. You can “get by” for a while, but there’s a breaking point – a point at which you can no longer do something. And that breaking point might not look very different from the day before – but it looks very different from months or years before. But we get so lost in the everyday that we forget about the overall effect of the creep. An analogy for this phenomenon is when my kids grow out of clothes. I know they’re growing slowly – they don’t shoot up an inch overnight. I see them every day and they don’t really seem that different from the day before. But then all of the sudden you look at them and realize those jeans or shorts are WAY too short. They started out long, and then fit fine for a while, and then were getting short but still passable, and yet all of the sudden you look at them one day and say “no – not any more!” But the kid isn’t really that different from they were the last time they wore those clothes (a few days or a week before) – but they are a lot different from the first time. At what point along the symptom creep does it become worthy enough to tell the doctor? At what point does it become too much to be able to continue to do things you’ve always done? And how do you explain to the doctor, friends or family why you’ve now all of the sudden reached a breaking point when today isn’t that much different than yesterday? How do you convince them that it’s valid and legitimate and severe when you haven’t mentioned it before or it hasn’t caused a change in your abilities up to that point? How do you get them to believe it’s noteworthy or behavior change-worthy today? How do you convince a doctor that it’s worthy of treatment now? This is just one more thing that invisible, chronic, degenerative disease sufferers deal with. Thank you so much, Sandra! It’s making such a huge difference to be able to communicate in this way – and the fact that it’s resounding with others makes it all the better! I find my own expectations for myself are always so much higher than others’…and they’re the hardest to ignore! I absolutely love your blog and have included it as my email signature to help teach those around me. I also have Sjogrens and learning to deal with it is incredibly tough. My symptoms are not exactly the same as yours but just as debilitating and difficult to work with. The pain and fatigue is hard enough to deal with but I think the toughest thing is the sense of isolation and the emotional aspect, especially other people’s reactions. I have never been so low or lonely before and your blog helps me get through as you so well articulate what I am feeling. Sometimes I wonder what is the point of my life now. Please keep going. Hopefully we can regain some equilibrium soon! Thank you from the bottom of my heart. Thank you! To know that expressing my journey can help others is amazing!